Visit Victoria’s most iconic attraction on this unique and memorable tour. Board a seaplane from downtown Victoria’s Inner Harbour for a stunning aerial tour, before landing dockside in Butchart Cove. Enjoy a delicious three-course dinner at the Dining Room restaurant, before wandering through the world-famous Butchart Gardens at your leisure. Return to downtown Victoria by limousine. Includes a 20-minute flight, admission to The Butchart Gardens, three-course dinner, limousine transportation and gratuities. Opt for a private limousine for an additional $60 including tax and gratuity. Below is an example of typical itinerary for this tour, specific times may vary. 7:00 pm – Arrive at Butchart Cove and stroll through the Japanese Gardens en route to The Dining Room restaurant for dinner. 7:30 pm – Enjoy a gourmet 3-course meal at The Dining Room Restaurant. 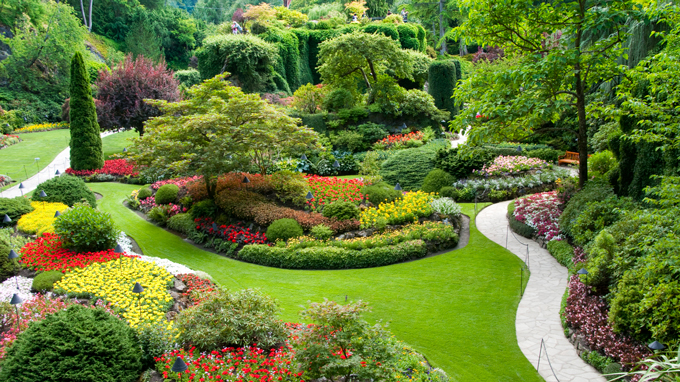 Upon conclusion of your dinner, enjoy strolling The Butchart Gardens at your leisure. 10:00 pm – Meet your limousine driver and return to downtown Victoria.